Generating revenue: are these the 14 questions to ask your customers? I say that the customer experience movement is, or should be, about creating superior value for customers and making customers feel valued. Why? So that they stick around longer, buy more and get people in their networks to do business with your organisation. Put differently, the focus on customer experience must at some point show up in revenues and profits. Else, it is not sustainable. I wish to give credit where credit is due: I have taken the work of Kristin Zhivago as shared in Roadmap to Revenue and added/modified it so that it fits with my experience and my style. If Kristin’s book interests you (in my view it should) then you can read my review here. Fascinating list of questions. Question 10 and 11 stood out for me as areas that we need to pay more attention to and point to how we are with customers. Further, there was a recent post by Jill Konrath (http://www.jillkonrath.com/sales-blog/bid/128567/Important-New-Research-on-Customer-Loyalty) that supports this and reports on recent research by the Corporate Executive Board that shows that a customers ‘Sales Experience’ is a major driver of customer loyalty (53%). I wonder if one of the central issues of customer research is that which you are practicing: selecting the questions which you think are the most important and focussing on them. Furthermore, I wonder is there is a hidden bias against asking the product centred questions? Time after time, I find that the organisation thinks that its products are just fine and it just needs to change the way it goes about marketing and selling them. I wonder where we would be if Jobs had taken that approach. Or Dyson had taken that approach? I wonder how many of those questions you really need to excel at to stand head and shoulders above the competition. You make a good point. Many a successful business is build on getting one or more of these questions handled/nailed in a way that speaks to a market segment. 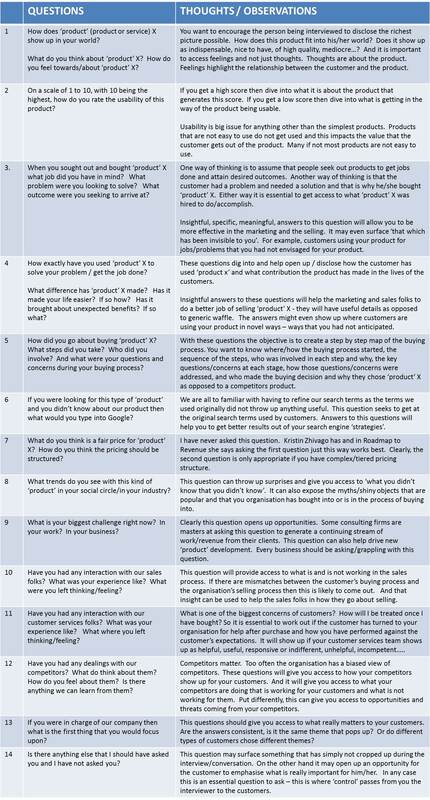 The idea behind these 14 questions is to get a rounded perspective/insight from customers. And thus figure out what matters to them and of course how the company is doing against what matters. It is worth bearing in mind that what matters is dynamic and so what mattered last year may not matter this year. Next Next post: Is customer-centricity going to lead you to ruin?